A few years ago, when my daughter shared an apartment in Point Loma, Calif., I drove up Garrison on the way home from her neighborhood. Houses along the way decked out big time for Christmas, such that traffic snarled as drivers slowed to gawk, others searched for parking, and pedestrians admired the decorations. My wife and I visited the street this evening, previewing what’s expected to come. 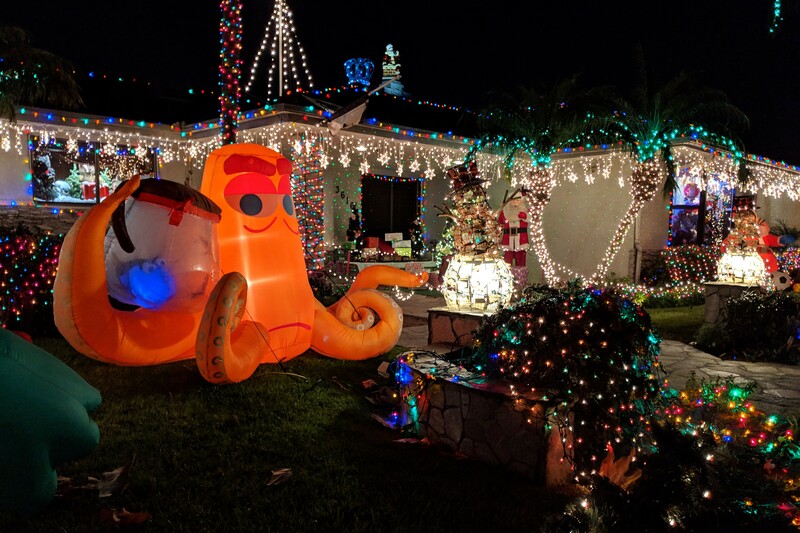 Only one house had spiffed up for the Holiday—and in unbelievably magnificent fashion. The Featured Image and three companions are but a glimpse of the fabulously adorned property. I captured the set using Google Pixel 3 XL, which proved to be more than a low-light performer. It’s a charmer. I am rather surprised to see character and dimension in these quick snaps. I cropped all four 3:2 and straightened two, but did not otherwise edit. Vitals for the first: f/1.8, ISO 176, 1/24 sec, 4.4mm; 5:35 p.m. PST (about 55 minutes after sunset). Anne and I will return to Garrison Street sometime in December.